Announced at the beginning of the year, the Olympus FE-5030 is a stylish, credit card sized camera featuring an unusually wide, 26-130mm equivalent zoom lens, a 14-megapixel sensor, mechanical image stabilisation, Advanced Face Detection, AF Tracking, four Magic Filters, SD card compatibility and a 2.7" rear LCD screen. Finished with a brilliant Double-Layered Crystal Shell, the FE-5030 is available in a choice of Indium Grey, Aquamarine Blue, Flamingo Pink and Pure White priced at £139.99. The Olympus FE-5030 is a neat little digicam that's only marginally wider - though obviously thicker - than a credit card. Upon its announcement, Olympus was making big noise about its Double-Layered Crystal Shell finish - which, in all honesty, sounded like pure marketing blabber at first. However, the camera does indeed have a nacreous shine that makes it very eye-catching when you see it in person. Apart from that, the design is simple, almost minimalistic. The lens, which sits fully retracted into the body when the camera is not in use, occupies almost the entire right half of the face plate. Spanning a 35mm equivalent focal range of 26-130mm, it goes wider than most compact camera lenses, though not quite as wide as the 24mm of the older FE-5020 model. Its maximum aperture is a fast f/2.8 at the wide end but a disappointingly slow f/6.5 at full telephoto. Upon power-up, the lens extends in barely more than a second, protruding about an inch from the face plate. When you turn off the camera, the lens retracts with similar haste. The rest of the front plate features a pinprick indicating a built-in microphone top right of the lens surround, a sliver of a window for the on-board flash and AF assist lamp, plus the indispensable Olympus and FE logos. The top panel offers even less in the way of controls, featuring only a small on/off button with a LED power indicator sitting right next to it, and an elongated shutter release. The back of the camera is dominated by the 2.7-inch LCD screen. This display offers adequate resolution for its size but, alas, rather poor visibility in direct sunlight. There is a "Bright" option in the Setup menu that should take care of this, but all it does is make the live preview look overexposed compared to the final image, so it’s better to leave the screen brightness at its default "Normal" setting. To the right of the screen, we find a cluster of controls that differ both from the FE-5020 and the current mju series digicams as well (though they have more in common with the latter). In the top right corner - when viewed from the back - we find the responsive if somewhat undersized zoom rocker. The zoom travels from wide angle to full telephoto in less than two seconds, which is excellent for this class of camera. On a less positive note, we haven’t really found a way to completely disable the digital zoom function, and it’s actually very easy to slip into the digital zoom range involuntarily when you are in P mode or one of the scene modes. Oddly, this is a non-issue in iAuto mode. Below the zoom controls is a slim Playback button that can be configured to act as a secondary Power button too - a good idea as you sometimes only want to turn on the camera to review your shots rather than to take new ones, in which case you do not need the lens to extend (and make noise doing so). A half-press of the shutter release takes you (back) to Record mode when you need it. A square four-way pad with a centred OK button, plus a Menu and a Camera Guide button round off the controls inventory. Notable by absence is the red movie record button and control wheel found on the more expensive mju series cameras such as the mju 7040 and 9010 we reviewed earlier. Not that they are a huge loss - in fact we have found the control wheel quite pointless anyway. Of more concern is the lack of direct access to exposure compensation and ISO sensitivity, both of which are unfortunately buried in the menu. In this respect, the new user interface is a step back from the FE-5020, where at least exposure compensation had its own dedicated shortcut button. The main shooting menu, accessible via a press of the self-explanatory Menu button, offers up a set of user adjustable shooting variables, including the shooting mode - P, iAuto, Scene, Magic, Panorama and Movie - and a range of other settings. These are limited to the flash mode, the self-timer and image resolution in iAuto mode, while the full set - available in P mode - includes the macro mode, exposure compensation, white balance and ISO sensitivity as well. The other shooting modes offer varying degrees of user control that fall between these two extremes. The last icon is invariably a >> sign, which takes you to the Setup menu. It is here that you can adjust the file quality settings, the autofocus mode and the image stabiliser, for instance. (The latter is a novelty on the FE-5030 inasmuch as the FE-5020 lacked any form of mechanical image stabilisation.) You can't, however, change the metering mode, and you don't get Shadow Adjustment Technology, either - these are saved for the more expensive mju series. The Setup menu is always accessible, regardless of which shooting mode you are in, but you sometimes get a "Conflicting Settings" message if you want to change something, without the camera bothering to elaborate on what settings it thinks are in conflict and why. Overall, I have found the menu system of the Olympus FE-5030 easy to get used to, but painfully slow to navigate. It takes too much time - and, often, too many button presses - to access important functions and change settings. As I have said above, one-button shortcuts to exposure compensation and ISO speed would really have been useful - these functions could easily have been mapped unto the Left and Right buttons of the four-way pad, for example. I also find it a bit frustrating that you cannot pick an AF point manually - you either entrust the camera with this task (in iESP mode) or use the central AF point only. There is a third auto-focus mode as well, called AF Tracking, but I did not find it particularly useful in real life. Finally, I couldn't get the camera to display a histogram, either pre or post capture - apparently, the designers didn't think that the target customer would ever want to use this tool. The FE-5030 has four so-called Magic Filters - Pop Art, Pinhole, Fish-eye and Drawing. Olympus' Magic Filters made their début on the E-30 digital SLR camera of 2008 under the name "Art Filters". That's what Olympus still calls them when they appear in a DSLR or Micro Four Thirds camera, but ever since the introduction of the mju Tough 6010, they have been calling them Magic Filters on their compacts. The Olympus FE-5030 has essentially the same Magic Filters as the FE-5020, and they work the same way as on that model. To wit, the Pop Art filter boosts saturation and contrast, the Pinhole filter alters the colours somewhat and adds a very obvious vignetting effect, the Fish-eye filter causes straight lines to bend outwards as if the picture was shot with a fish-eye lens (it does not recreate the ultra-wide angle of view though), while Drawing does exactly what it says on the tin and converts your photos into black-and white drawings. The movie mode of the Olympus FE-5030 seems a bit pedestrian for 2010. There is no HD option - the resolution choices are VGA (640x480 pixels) and QVGA (320x240 pixels), while the frame rate can be either 30fps or 15fps. The optical zoom can be used while filming, but only if you turn off sound recording. Put another way, if you want video with sound, you'll have to make do with digital zoom. The clips are stored in AVI format. A big novelty on the FE-5030 - and all Olympus models in the Class of 2010 - is the presence of an SD card slot. While Olympus offered SD card support for its Micro Four Thirds cameras from day one, it had hitherto stuck with xD-Picture cards in its compacts. It appears that xD is officially dead now, though owners of older Olympus compacts wishing to trade up can probably use their existing xD-Picture cards via an adapter. 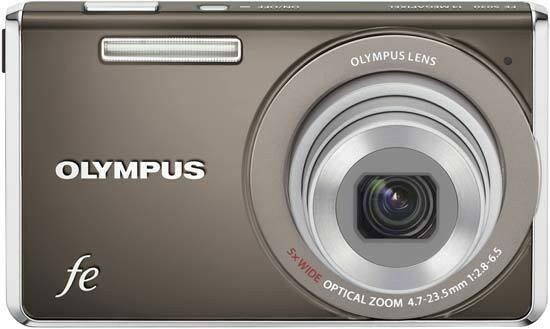 New users are advised to purchase an optional SD or SDHC card for the camera - while the Olympus FE-5030 does have some built-in memory, it will only hold about eight images at the highest resolution. The Olympus FE-5030 is powered by a proprietary Li-ion battery - the venerable LI-42B - which shares its compartment with the memory card. You can charge the battery in the optional LI-41CAB mains charger or in-camera, via USB. Camera performance was something of a mixed bag. Power-up, power-down and zooming were all very fast for this class of camera, but focussing - especially in low light at the telephoto end of the zoom range - was a bit slow, though this was to be expected given the f/6.5 maximum aperture, and is not unusual in this market segment. What's more worrying is that the camera would often give false focus confirmation at the telephoto end, which sometimes resulted in blurry pictures that had to be retaken. Once focus and exposure lock is achieved, shutter lag is a non-issue. As far as continuous shooting goes, well, there is no such option on the FE-5030 at all. Shot-to-shot times are simply miserable - you can take a photo every five seconds or so. Compact cameras have never been a great choice for sports and action, but most of them can do better than this. This concludes our evaluation of the handling, features and performance of the Olympus FE-5030. Let us now move on to the image quality assessment!